Markings: The left side of the barrel is marked “45 COLT. The left side of the frame is marked “PAT SEPT.19.1871. / JULY 2,72. JAN.19,75.” and with a Rampant Colt logo. The top of the barrel is marked “COLT’S PT. F.A. MFG. Co. HARTFORD, CT. U.S.A.”. The underside of the frame at the trigger guard and the trigger guard are marked “219505”. The bottom of the backstrap is marked with “219 / 505”. The top rear of the loading gate is marked with an assembly number “635”. The front of the frame is marked in script with the initials “CB” (that’s our best guess, but it could be “CR”, so please see our pictures, and if you know who the engraver is, please let us know.). The back of the frame under the hammer and above the cylinder pin hole is marked “W”. Sights / Optics: This revolver is mounted with a “V” groove in the top strap for a rear sight and a tall quarter-round blade front sight fixed to the barrel. Stock Configuration & Condition: The grip is a one-piece smooth bone with light grain patterns in the sides of the grip and a thin dark surface crack in the right side. There are a few very light handling marks in the sides of the grip. The grip rates in about Fine Plus overall condition. Type of Finish: The finish is blued. There is scrolling engraving on everything but the underside of the barrel and the front strap, with border engraving along the top of the ejector rod housing and at the rear of the cylinder. There is also a gold-filled band at the rear of the cylinder and another around the front of the barrel. Finish Originality: The finish was applied after the surfaces were engraved and is not original. Bore Condition: The bore is gray with moderate wear in the rifling. There are spots of light erosion scattered over the bore with a few spots of moderate erosion at the muzzle. Overall Condition: This revolver retains about 65% of its current metal finish. There is light pitting under the finish in the front and rear surfaces of the cylinder and in its flutes, and at the front of the barrel, with light file marks and light erosion under the finish at the rear of the ejector rod housing. There are also tiny dings under the finish in the underside of the ejector rod housing. There is finish loss on the backstrap, front strap and trigger guard, with light thinning on the reminder. There are a few light handling marks scattered over the surfaces with a deep drag line under the finish of the cylinder and a light partial drag line in the finish. The screw heads are sharp and the markings are clear. The revolver is in about Very Good condition as refinished. Our Assessment: The Colt SAA revolver and Winchester Model 1873 rifle were two guns that helped tame the Wild West of the United States in the last quarter of the 19th Century. This is a nearly one hundred and eighteen year-old Colt SAA 1st Generation revolver made in the Early Smokeless Powder period. The revolver has a 5 ½” barrel, bone grips, and is chambered in .45 Colt. The entire revolver with the exception of the front strap and the underside of the barrel has been scroll engraved and then refinished in blue. 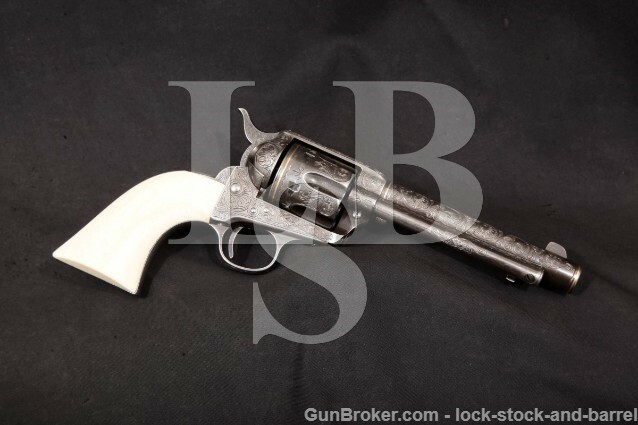 The revolver is in about Very Good condition with about 65% of its current finish remaining. The bore is gray with moderate wear in the rifling and spots of moderate erosion near the muzzle. All of the Colt 1st Generation revolvers are heavily collected, and we expect this one to be as well. The bone grips really set off the deeply engraved surfaces. Please see our pictures to see how nice looking this revolver really is, and good luck in your bidding.